The recliner market in India is tiny compared to the West, but it is growing. All you ever wanted to know about recliners. It's almost everybody's idea of a perfect end to a stressful day: sinking into a comfy chair in front of a TV with a bag of chips in your hand. And if that chair is a warm and cozy recliner, it's even easier to put all your work worries away. As Adish Jain, CEO of a multinational in Delhi, puts it: "Life in a bustling metro keeps me on my toes and my recliner is where I take my shoes off. It's like soul food that you can never get enough of." Jain is not the only diehard recliner fan in India. Although they have always been a part of Western homes for decades, recliners are now also found in many Indian family rooms. Actor Boman Irani, for example, heads for his recliner after a long shooting schedule - and doesn't budge from there for as long as he can. He prefers to even have his dinner in his customised brown suede recliner instead of dragging himself to the dining table. It is also the spot from where he loves watching movies and taking a nap on weekends. Quite simply, a recliner is an upholstered armchair that tilts backwards to put the body in a relaxing position. It also has a footrest that rises when the chair is reclined. It was invented in the United States in the early 1920s, but the now iconic La-Z-Boy first made the chair a household name overseas. According to US magazine Furniture Today, the recliner market in the US grew to $3.9 billion (around Rs 24,000 crore) in 2012 from $3.7 billion (around Rs 23,000 crore) in the previous year. The recliner market in India is estimated much lower at around Rs 120 crore - but it's a rapidly growing market. "With the Indian urban space offering almost none or very little outdoor entertainment, walking parks, play grounds etc, people are getting accustomed to sitting in front of their TV screens, when they get back home. Such a trend will see upward growth for the recliner market in India," says Sunil Suresh, who markets international recliner brands such as La-Z-Boy and Norway's Stordal in India. The market is packed with recliners for everybody from connoisseurs to commoners. While a basic PVC-upholstered single seat recliner comes for just Rs 18,000 and a simple La-Z-Boy costs around Rs 29,000, you could fork out up to Rs 10 lakh for chairs with bells and whistles. One of the more expensive options is the Rs 3-lakh Royal Design chair from the country's largest recliner manufacturer, Recliners India. Inspired by Victorian designs, the royal blue suede-upholstered recliner is fitted with a sensor that automatically switches off when not in use. It also has a silent subwoofer, dubbed "The Buttkicker", which makes you feel the thump with increased power sound. Massage recliners are becoming popular, but are not as big in India as they are globally. If you are looking for something more stylish, you can put your feet up with the Elvis model from Buddy's, an Indian brand at Stanley Lifestyle, which markets La-Z-Boy in India. This unique motorised recliner can power up to 400 reclines from only four hours of charging. Equipped with a noiseless German motor, it offers individual movements for the back and footrest, unlike other recliners. The red leather Elvis doesn't come cheap: you have to shell out around Rs 2.5 lakh for the comfort of this chair. Traditionally, women have never been big fans of recliners. They prefer sofas for the simple reason that you can share a sofa but you can't share a recliner. Not any more. The new generation of recliners offers two-seaters and multiple-seat options that allow families to watch films together. 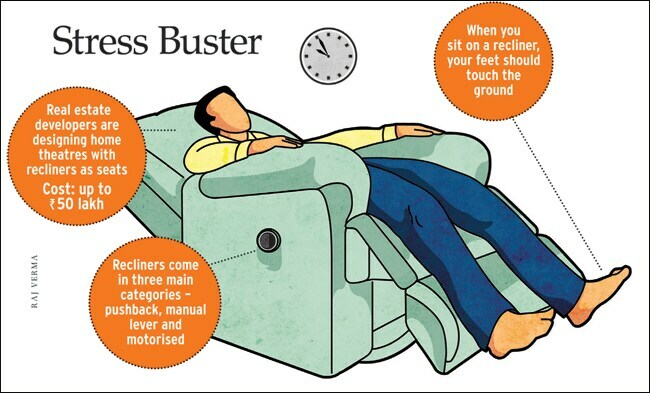 "The average sitting-down time increases three times upon installing a recliner at home," says Neeraj Bansal, co-founder and CEO of Recliners India. Recliners India has a treat in store for movie buffs and serious gamers: the Home Theatre Recliner with D-Box technology, which syncs a movie's actions and sound to the recliner's movement. The extravagant Rs 9-lakh chair brings the virtual experience closer to reality by making the user experience every jolt, nudge or bump in the recliner. There are about 1,000 Hollywood titles that can be synced to this box, which is always connected to the Internet. Started in 1996, Recliners India specialises in cinema seating and has introduced a new class of recliners for Gold Class theatres. The company controls more than 95 per cent of the commercial recliner market and its clients include top theatres such as Cinemax, PVR and Big Cinemas. Recliners India has research and development facilities with state-of-the-art technology to develop its recliners. Recliners are not for just for the young. There is a motorised recliner designed for the elderly that can bring a user from reclining to walking position. The Auto Lift Chair for seniors is equipped with "easy-lift recline" technology that moves the entire chair at a slower speed, to allow a user to easily come out of the recliner and walk. The PVC version at Recliners India is priced at Rs 75,000. "Recliners are advisable for the elderly as they are not very active. As they spend the day sitting and watching television, they tend to collect fluid in the legs. Recliners lift the legs and make the blood flow better," says Dr Naresh Trehan, who has installed recliners for patients at Gurgaon's Medanta hospital and, before that, at Delhi's Escorts Hospital. Doctors say recliners also have health benefits. "Recliners are definitely a good form of relaxation because they fit the curves of the body and our muscles have to work less to support those curves," says Dr Raman Kant Aggarwal, Shoulder Specialist and Joint Replacement Surgeon, Fortis Memorial Research Institute, Gurgaon. "Recliners, at times, serve as the only option in certain disorders like sleep apnoea and virtually any shoulder pain." But doctors warn that recliners cannot make up for lack of exercise. 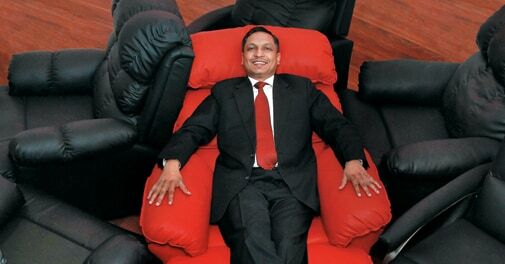 "If we are not exercising, recliners cannot help us improve our health," says Dr Aggarwal. "We need to strengthen our muscles by walking, yoga etc while resting recliners can provide comfort to our muscles and bones."